This entry was posted in Data Exploration, Progress Reports. Bookmark the permalink. 9 Responses to Some (finalish) results! 1. You could use date.phylo() (tute here: http://www.graemetlloyd.com/methdpf.html) to time-scale your tree. I’m not quite sure what you have done, but I assume if you dated your tree the “traditional” way (all nodes equal in age to their oldest descendant) you would have created a whole bunch of zero-length branches that might be the issue. 2. You should really be using PGLS, not PIC to regress your data against phylogeny. You can do this in R with the “caper” package (and probably some others). I doubt this will mater much though. Thanks for the comments–very helpful! PGLS vs. PICs is perhaps a point of more debatable contention as far as I can tell, although I certainly appreciate that some of the assumptions of PICs are not really supported in any realistic dataset (e.g., the Brownian motion assumption). In any case, I’m sitting down with Wedel today, and we’ll be running that analysis. 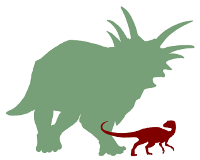 The tree was created/edited in Mesquite; there are no zero-length branches, although there are lots of short-length branches (not much I can do about this when we’ve got a gazillion nearly contemporaneous sister taxa–hadrosaurids are perhaps the most egregious example). In any case, as I port the data into R, I’ll certainly give the data.phylo function a go. No worries. Happy to help out if you have any issues with it. Can even sit down at a laptop at SVP if it still isn’t finished by then! PS – I was going to ask if it would be possible to use your data in some teaching exercises at the Paleobiology Database course. Would that be OK? Hi everyone, I know it’s been a while but is there any chance we’d be able to get a paper written? Thanks for the prod. After a strong push last year, we lost momentum. We’re going to do our best not to let that happen again. Between travel and general deck-clearing, April is pretty well shot for us, but May looks promising–that’s when we were able to get a lot done last year. This year we just need to get it across the goal line. This year we just need to get it across the goal line. Looking forward to it! Anything we can do to help? Hi! I was wondering if there’s any news on progress on this project, or if there are any plans to write up a paper soon. It would be cool to see all the collected data and analyses published. Thanks! It’s the new year! Should we try to get a paper out?